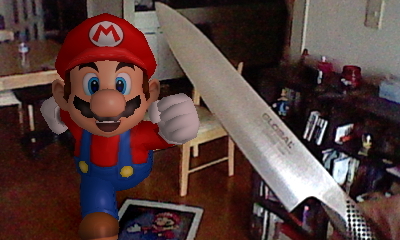 What's the only thing better than a standard Nintendo 3DS AR card? That's easy! 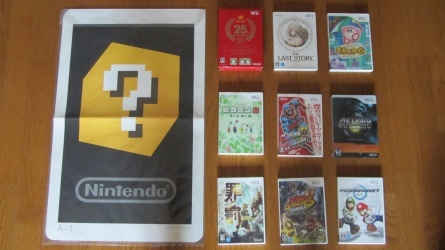 A Nintendo 3DS AR card sixty times its size. 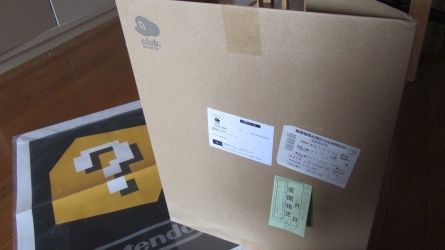 Recently released to the first Club Nintendo buyers in Japan, this disgusting behemoth, printed in full color on a huge piece of slightly-thickish paper, is primed to take up way more space than anyone in Japan even has. It's so large it won't even fit in your mailbox, so you won't receive the delivery and when faced with the need to reschedule it you will think "it is just a big card" and keep putting it off and putting it off till you have to call them special and be all like "no, I'm sorry, please bring it, yes I'll be here" and then they bring it and you are like oh it's this card. It is shipped in this large cardboard sleeve, which for purposes of durability it must essentially live in, the card itself sheathed in plastic. You have to hand it to Nintendo when it comes to the details—it's identical to the standard ? block AR card, printing and all, just enormous. Why, it's just so goddamned huge! Look at this whalelike monstrosity, this fetid beast, fat for the execrable winter! It's as large as all of these Wii games, and easily nine times as fun as any one of those pieces of last-gen home console trash. On the other side of the card, we discover the famous Mario! What a winsome fellow. He gleefully poses for pictures, though fated to meet the end of my blade. His accursed soul must be returned to its papyrus shell, to remain until the End Times. So does the card work? Of course! Personally, I am both overjoyed and querulously dismayed at its persistance, since it will exist until I dispose of it. Until July, this flimflam can belong to anyone in Japan for a mere 100 Nintendo points, just low enough to make impulse buys reasonable. After July the cost will soar to a reckless 250 points. For perspective, only 400 points are required to reach platinum level in Japan's Club. Are there better things to spend your points on? Only if you like literally anything.